Clark Industrial is the major supplier of industrial polyethylene tanks for the storage of molasses and other liquid feed products. Having manufactured industrial grade tanks for the agricultural sector for more than a decade, we have a proven track record for quality and workmanship. 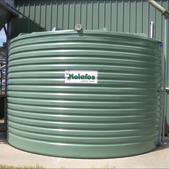 We specialise in custom-fitted industrial tanks to suit specific applications and on-farm usage. As a strategic partner with national corporations that supply molasses to the marketplace, we are dedicated to providing quality industrial tanks and a professional service.